The Belgian typographer Fernand Baudin, in How Typography Works (and why it is important) (New York: Design Press, 1988) wrote, “Novices are mistaken when they suppose there should be a ‘technical term” for every product of their enthusiasm & ignorance.” (p. 98)*. Although Baudin wrote this at the beginning of the digital type revolution—his text was originally published in French in 1984—his words are still applicable today. Indeed, they seem especially relevant as the horde of contemporary type geeks seem to feel that every part of every letter of the alphabet must, like the bones in the human body, have a name. This was not the view of printers and typographers of the past. Bibliographer Philip Gaskell cites Joseph Moxon as the ﬁrst to provide a vocabulary for the parts of letterforms. In Mechanick Exercises (1683), Moxon deﬁned nine “particular Terms relating to the Face” of type as part of his discussion of punch cutting (pp. 126–127). They are 1. “The Topping;” 2. “The Footing;” 3. “The Bottom-Footing;” 4. “The Stem;” 5. “Fat-Stroaks;” 6. “Lean Stroaks;” 7. “Beak of Letters;” 8. “Tails of Letters;” and 9. “Swash Letters.” These terms do not match contemporary ones and none are illustrated. He deﬁnes topping as “the straight ﬁne Stroak or Stroaks that lie in the Top-Line of Ascending Letters…;” footing as “the straight ﬁne Stroak or Stroaks that lie in the Foot-Line of Letters, either Ascending or Descending;” and the beak as “the ﬁne Stroak or Touch that stands on the Left Hand of the Stem.” Topping and footing refer to bracketed head and foot serifs and beak refers to angled head serifs. Joseph Thorp “Towards a Nomenclature for Letter Forms” (1931). This is one of two pages of nomenclature. In “A Nomenclature for the Letter-Forms of Roman Type” The Library (1974) [Series 4: vol. XXIX, no. 1], pp. 42–51, Gaskell cites printing consultant Joseph Thorp, author of “Towards a Nomenclature for Letter Forms” (published in the April–May 1931 issue of The Monotype Recorder), as the ﬁrst to illustrate the parts of letters. He complains that, “Thorp’s paper, though it deals with the description of serifs, terminals, etc., in great detail, omits to deﬁne some important terms (e.g. stroke, tail) while including others which may be dispensed with (e.g. loop, spine).” Typographers today would disagree with Gaskell’s view of what is and what is not important. On the other hand, they would agree with him that Thorp’s illustrations, although pioneering, fail to be comprehensive. Whatever was generally accepted in Britain in 1974 must have been based on oral tradition. There is no discussion of the anatomy of letterforms in the revised edition of An Introduction to Typography by Oliver Simon (London: Pelican Books, 1954). Nor, for that matter, is there any in Typography by Aaron Burns (New York: Reinold Publishing, 1961), Typographie: Ein Gestaltungslehrbuch by Emil Ruder (Teufen, Switzerland: Verlag Arthur Niggli AG, 1967)—available in English as Typography—or Design with Type by Carl Dair (Toronto and Buffalo: University of Toronto Press, 1967), three widely praised books on the subject. (The latter two were reprinted in subsequent decades and Ruder’s remains in print today.) Clearly, the terminology of letterforms was not a major concern to typographers in the 1960s, including some of the best of the time. 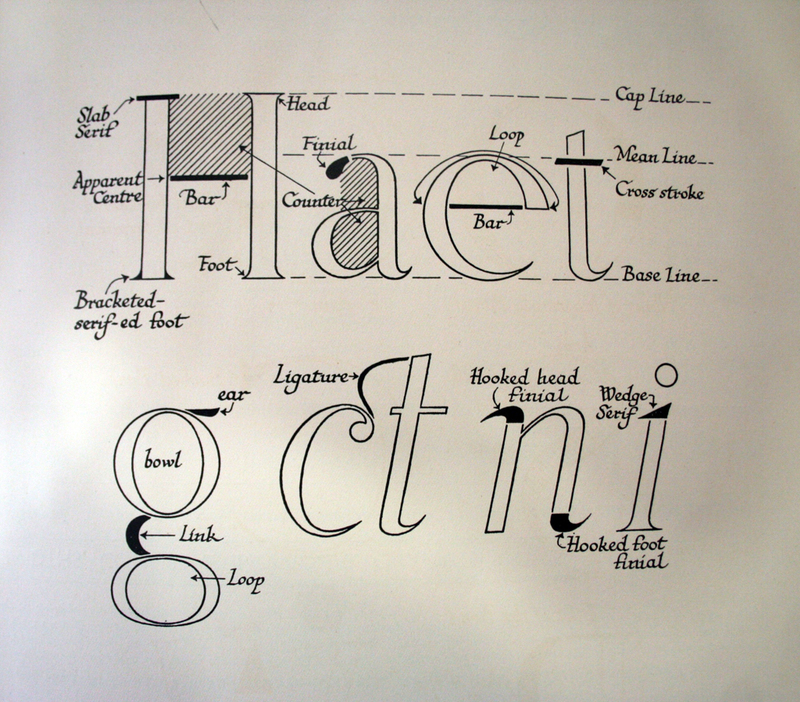 John R. Biggs Basic Typography (1968). However, another popular book from the 1960s, Basic Typography by John R. Biggs (London: Faber & Faber, Ltd., 1968), does contain some terminology. It has a single page on the “Names of the parts of letters” using letters that, like Thorp’s, are hand drawn as opposed to taken from speciﬁc typefaces. Although Biggs mixes serif and sans serif characters, his terms are deﬁcient and even confusing. Sheared terminal is included but not lobe terminal or ball terminal; and counter and bowl are indicated to be one and the same thing. Previously, Thorp’s illustrations had been adopted by several American writers on typography: e.g. Printing Types: And How to Use Them by Stanley C. Hlasta (Pittsburgh: Carnegie Press, 1950) and Types of Typefaces and How to Recognize Them by J. Ben Lieberman (New York: Sterling Publishing, 1967). (I have not seen either book, so cannot comment on the quality of their diagrams.) His influence even continues online today. See The Nomenclature and Fundamental Structures of Letter Forms by Sarah Pittenger (2012) which is beautifully designed but still wanting. Philip Gaskell “A Nomenclature for the Letter-Forms of Roman Type” (1974). This is one of three pages. “The discussion of type-faces requires a system of nomenclature for the elements of the letter-forms so that individual parts of printing types can be referred to,” Gaskell wrote in his 1974 article. At ﬁrst glance, his nomenclature is far more detailed than Thorp’s, but closer inspection shows that the advance is minuscule. 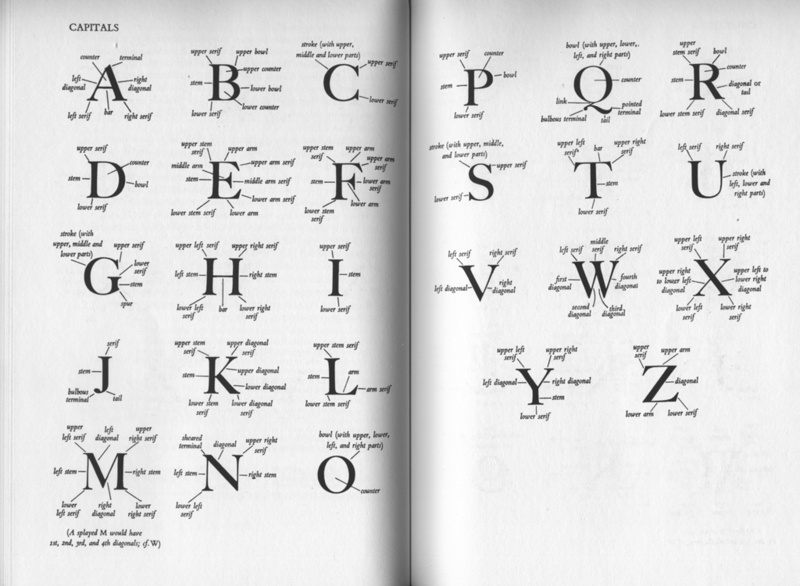 Gaskell illustrates the parts of every capital and lowercase letter in the alphabet (e.g. A has left diagonal, right diagonal, bar, terminal [apex], left serif, right serif and counter) but because he uses Caslon 471 he misses some terms (e.g. he has bulbous terminal but no lobe or ball terminal). Despite this, his text has become a standard reference source for bibliographers and printing historians. But professional typographers did not do much better than Gaskell in the 1970s and 1980s. Typography: Design and Practice by John Lewis (New York: Taplinger Publishing Company, 1978) has no terminology of letterforms—not even in its glossary. Neither does Type by David Gates (New York: Watson-Guptill Publications, 1973). The German books that I own are equally empty: Schrift und Schreiben by Hildegard Korger (Leipzig: Fachbuchverlag, 1971); Geschichte der modernen Typographie by Herbert Lechner (Munich: Verlag Karl Thiemig, 1981); Typographie: Herkunft, Aufbau, Anwendung by Philipp Luidl (Hannover: Schlütersche Verlagsanstalt und Druckerei GmbH & Co., 1989); and Grundlagen der Typograﬁe by Walter Bergner (Leipzig: Fachbuchverlag, 1990). James Craig Designing with Type (1980). The revised edition of Designing with Type: A Basic Course in Typography by James Craig (Watson-Guptill Publications, 1980) is embarrassingly minimal in its “Anatomy of a Letter” section (pp. 14–15) with a simple chart and only explanations for x-height, ascender, descender, counter and serif. Craig’s book, with William Bevington as co-author, has been updated several times since and is still in use as a textbook. The Thames and Hudson Manual of Typography by Ruari McLean (London: Thames & Hudson, Ltd., 1980) p. 76 has a mixed bag of anatomical information: letter parts, styles of serifs and letter measurements. McLean does use a few italic letters, but his deﬁnition of loop as part of the descender of an italic f seems odd to me. 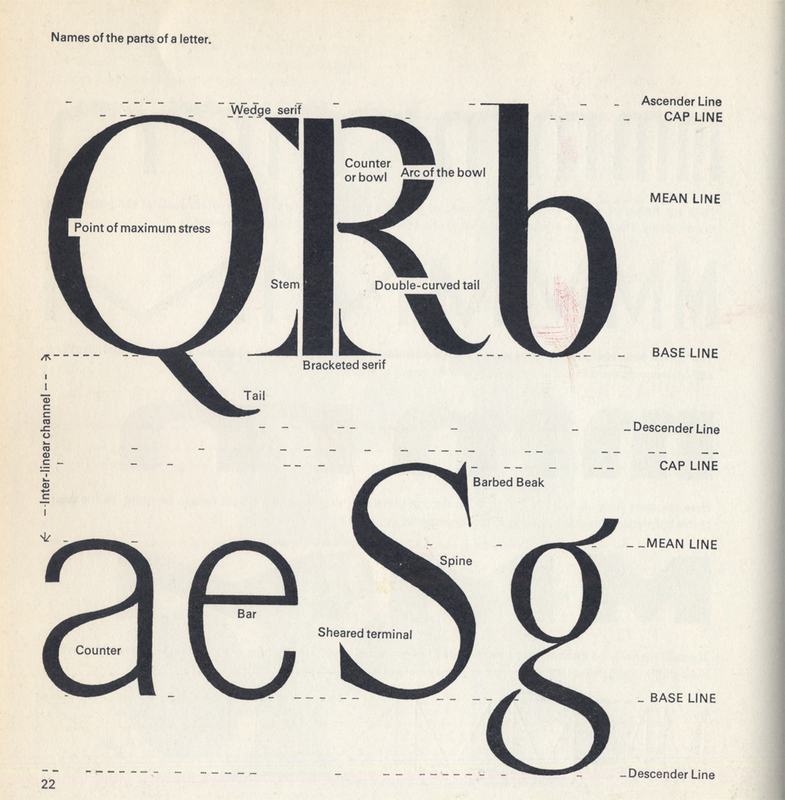 Ruari McLean The Thames and Hudson Manual of Typography (1980). Typographic Design: Form and Communication by Rob Carter, Ben Day and Philip Meggs (New York: Van Nostrand Reinhold Company, 1985), pp. 26–27 is rare for using multiple typefaces to explain terms, but the number of terms illustrated is still small in number. 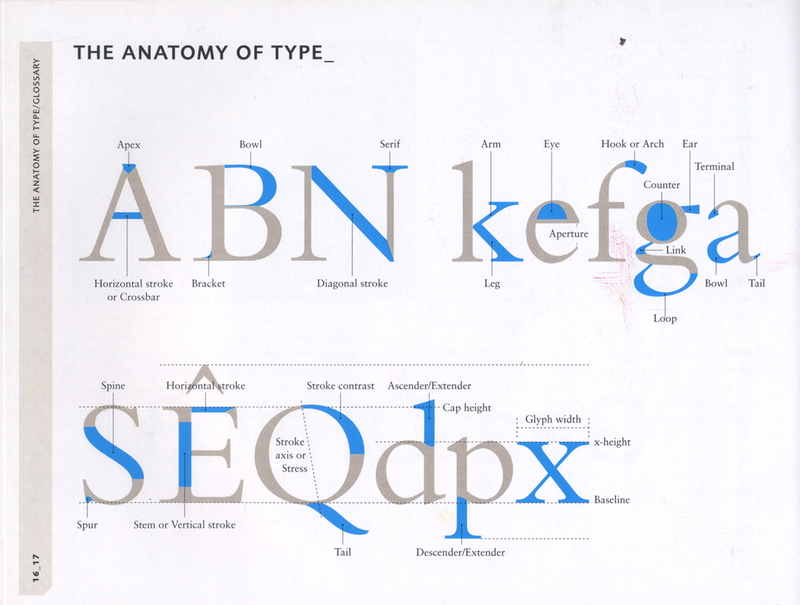 The Art of Typography: An Introduction to Typo.icon.ography by Martin Solomon (New York: Watson-Guptill Publications, 1986) has a chapter on “Typographic Terminology” which contains a tiny diagram on the “Anatomy of Type” (p. 89) with letters set in Caslon 540. It not much of an improvement on Thorp. The only unfamiliar term is swell, the outermost point of a curve or bowl. 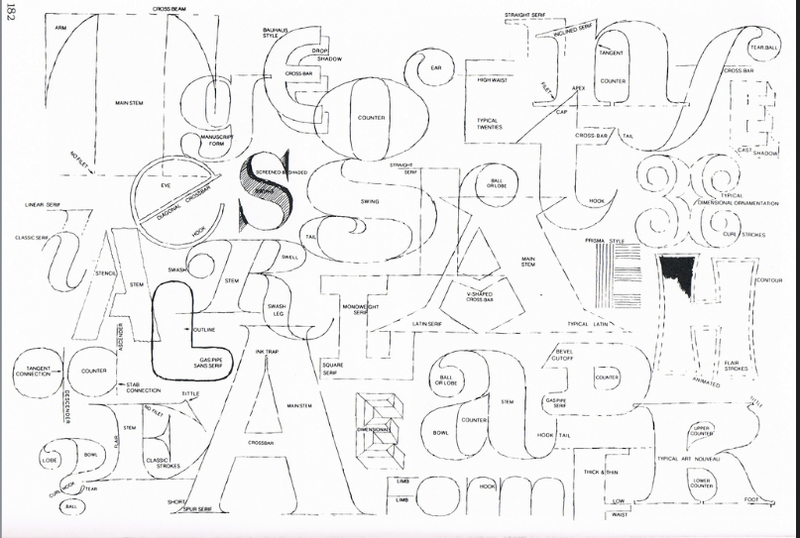 Sometime in the early 1980s, while working for Photo-Lettering, Inc., Ed Benguiat designed a very detailed poster showing the various parts of letters. 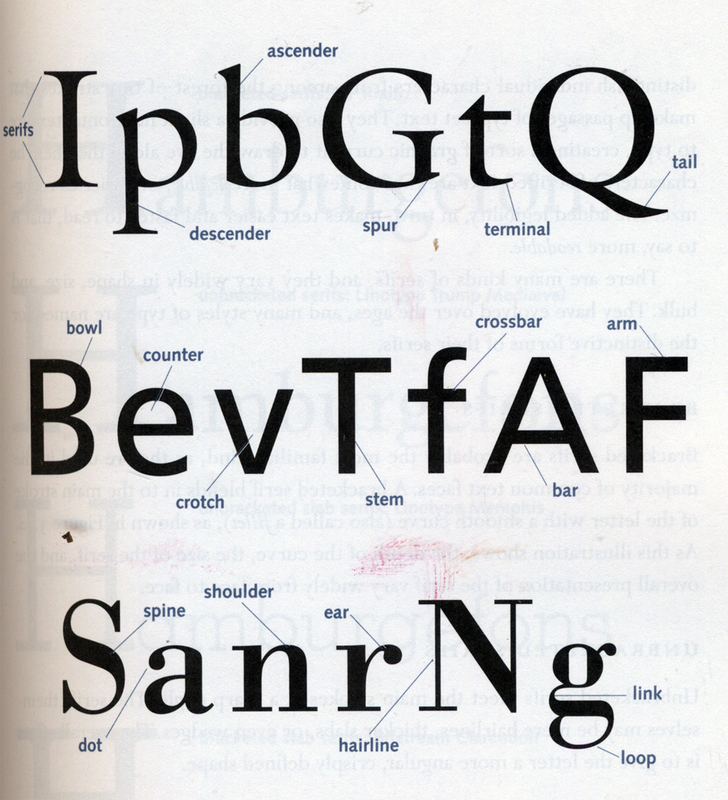 Joe Clark has posted a scan of it online as “Benguiat’s Anatomy of Letters”. All of the letters, which represent a welter of styles, have been drawn by Benguiat in outline. The chart is the ﬁrst truly detailed elucidation of letterform terminology that I am aware of. I assume that it is based not only on Benguiat’s long experience as a hand letterer and type designer but also on the accumulated knowledge of the staff at Photo-Lettering, Inc. The poster is very hard to come by. Nearly a decade ago I asked Ed for a copy and he promised to get me one. Periodically he reassures me that he has not forgotten. I am not holding my breath. 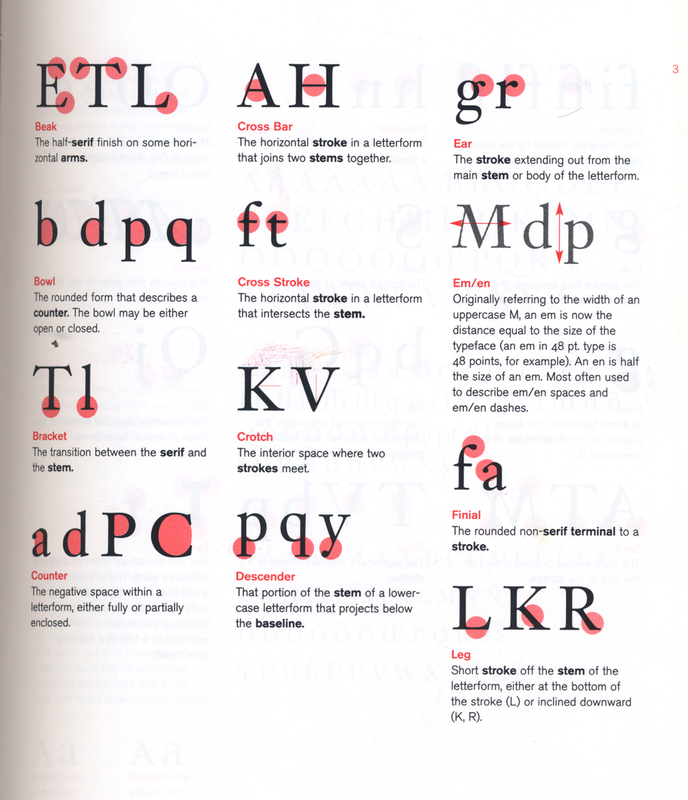 Doyald Young Logotypes & Letterforms (1992). The book that ﬁrst advanced the terminology of letterforms is Logotypes & Letterforms: Handlettered Logotypes and Typographic Considerations by Doyald Young (New York: Design Press, 1993). “Parts of a Letter” (p. xvii) is highly detailed, though it does not include many of Benguiat’s terms. Young uses ITC Baskerville and, for a few letters, other typefaces (Craw Modern and Centaur). Some of his terms are unusual: e.g. branch for what many call the arch of an h, n or m; or diagonal stem as an alternative description for the leg of R. As with all of the other terminology charts discussed so far, his vocabulary—with the exception of pothook to describe the entry and exit strokes of an italic n—is limited to seriffed roman letters. In Fonts & Logos: Font Analysis, Logotype Design, Typography, Type Comparison, and History by (Sherman Oaks, California: Delphi Press, 1999), Young extended his “Parts of a Letter” diagram to two pages (pp. 20–21), included a few more letters in other typefaces (Fournier and Bauer Bodoni), and added commentary. Young’s work did not take root immediately. Understanding Type for Desktop Publishing by Paul Luna (London et al: Blueprint, 1992) was one of the ﬁrst books on typography geared to the new digital environment. 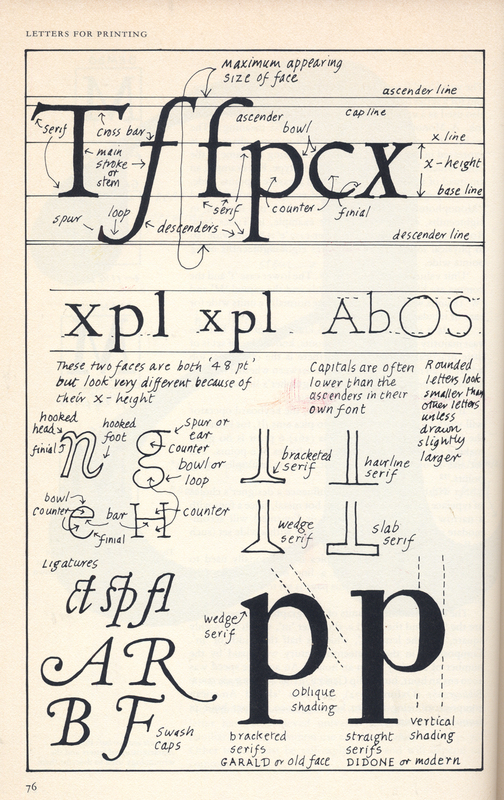 It has a modest terminology chart (p. 33) in the chapter ‘How do typefaces differ?” that covers even less than Thorp did: thick and thin strokes, bowl, counter, serif, ascender and descender. There is no x-height. Thinking with Type: A Critical Guide for Designers, Writers, Editors & Students by Ellen Lupton (New York: Princeton Architectural Press, 2004) is nearly as poor. She includes a minimal anatomy illustration (p. 34)—set in Adobe Garamond (including italic and small caps)—in which some letters have no illustrated parts. It covers less than Thorp did seventy years before. Her chart appears on a number of websites. The Elements of Typographic Style by Robert Bringhurst (Vancouver: Hartley & Marks, 1992) has become one of the most popular typography textbooks over the past twenty-ﬁve years (translated into French, Italian and Spanish),yet, for all of its bookishness, it has no anatomy of letterforms. Meanwhile, the slender Skrift og Skriftvalg [Type and Typography] by Poul Søgren (Copenhagen: Dansk Design Center, 1995 includes only serif, stem, thin stroke and counter in its terminology illustration (pp. 10–11). James Felici The Complete Manual of Typography (2003). The Complete Manual of Typography: A Guide to Setting Perfect Type by James Felici (Berkeley, California: Peachpit Press, 2003) is an excellent book overall, but its type anatomy (p. 33) only covers “the most important terms”. Type and Typography by Phil Baines and Andrew Haslam (New York: Watson-Guptill Publications, 2002) is another outstanding typography book that has a limited letter parts terminology diagram (p. 38). A Type Primer by John Kane (Upper Saddle River, New Jersey: Prentice-Hall Inc., 2003) is the ﬁrst introductory typography book to have a substantial terminology. Over the course of three pages (pp. 2–4 “Describing letterforms”) Kane, using Janson, includes such terms as crotch and shoulder; and differentiates between cross bar and cross stroke and between spur and barb. That said, it still falls short of what Benguiat and Young achieved. John Kane A Type Primer (2003). This is page two of three. The Typographic Desk Reference by Theodore Rosendorf (New Castle, Delaware: Oak Knoll Press, 2009) has letterform terminology deﬁned amidst other typographic terms. Illustrations are in the margins individually and collectively (p. 97—using Adobe Caslon). The list of terms contains a few new items such as flag, chin, and arc of stem (Young’s branch and my arch). The above sites are still better than common sources of internet information such as Wikipedia and about.com, both of which fail to have meaningful entries for the nomenclature of letterforms. The font companies are equally bad. Adobe provides an unillustrated rudimentary glossary. Letraset focuses (oddly for them) on metal type, but does have a tiny illustration of letterform parts which includes wedge serif but not bowl, crossbar, eye, arm, leg or tail. Fonts.com is a bit better, though its decision to use the diagonal of N to explain stroke could be confusing. By 2010 a few websites had begun to post letterform charts and texts that went beyond those in most printed books on typography. Many new terms began to enter the typographic vocabulary, some of them useful, others arcane; some as reasonable alternatives to existing terms and some as wrong-headed or confusing alternatives. In 2008 Paul Dean posted a ﬁve-part series on “eXtreme Type Terminology” on ilovetypography.com that brought in jot and tittle as alternatives to dot on i and j, flag (as a blackletter term), inline, Ed Benguiat’s swing, cross beam (to describe the crossbar of H), and more. Unfortunately, most of the terms are unillustrated. Playtype.com has a modest “Letterform Anatomy” illustration that nonetheless manages to increase the existing vocabulary with dubious references to the bowl of p as a lobe (FontShop does something similar with g) and the top of t as the apex, though I like its addition of neck as an alternative to link to describe the joining stroke of g since I have usually used that term. It oddly reverses the usual meanings of arch and shoulder. The images online for the Typography Deconstructed poster (set in Adobe Caslon) by typographydeconstructed.com are too small and blurry for me to assess its quality. The new terms appearing online have not had an impact on typography books. They continue to have limited—sometimes woefully so—diagrams to illustrate letterform parts. Typography Referenced: A Comprehensive Visual Guide to the Language, History, and Practice of Typography by Allan Haley, Richard Poulin, Jason Tselentis, Tony Seddon, Gerry Leonidas, Ina Saltz, Kathryn Henderson and Tyler Alterman (Beverly, Massachusetts: Rockport Publishers, 2012)—one of the worst books on typography in recent years—includes “Anatomy of Type” (pp. 328–329) by Tony Seddon with Ina Saltz. Set in Goudy Oldstyle, the letters are enormous but the amount of information is small. Among the undeﬁned and unillustrated letter parts are leg, ball terminal, lobe and spur. Like fonts.com it uses the diagonal of N to deﬁne stroke. (Most terms are indicated by colored portions of letters—except the tail of Q.) The Field Guide to Typography: Typefaces in the Urban Landscape by Peter Dawson (London: Thames & Hudson, Ltd., 2013) includes an anatomy of type diagram upfront (p. 16). It rightly refers to the diagonal stroke of N, but calls the curved part of f an arch as well as a hook. Since it is set in Bembo both ball and lobe are missing. 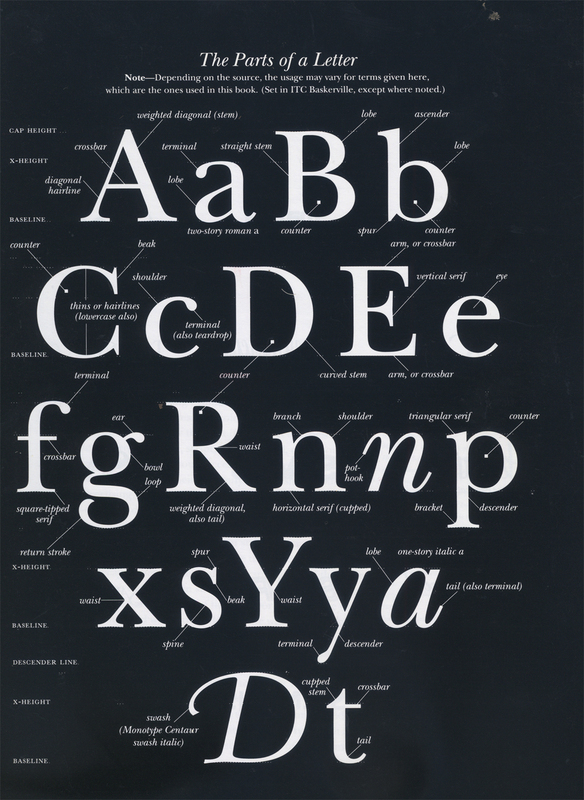 Dawson’s chart probably comes from The Anatomy of Type: A Graphic Guide to 100 Typefaces by Stephen Coles (New York: Harper Design, 2012). [The British edition of the book has a different title.] Coles’ diagram (pp. 10–11) has the same name and also uses Bembo—and the same terms, including arch for the curve on f. Despite its minimal amount of information the diagram has been spread out over two pages like the one in Typography Referenced. Obviously, bigger is not better. Peter Dawson The Field Guide to Typography (2013). Letterform terminology seems to be of little interest to Swiss and German typographers (including those writing for an Anglo-American audience), even in the digital age. It is absent from all of the following highly-regarded books: Stop Stealing Sheep & find out how type works by Erik Spiekermann and E.M. Ginger (Mountain View, California: Adobe Press, 1993); Typography: Macro + Micro by Willi Kunz (Sulgen, Switzerland: Verlag Niggli AG, 1998), Erste Hilfe in Typographie: Ratgeber für Gestaltung mit Schrift by Hans Peter Willberg and Friedrich Forssman (Mainz: Verlag Hermann Schmidt, 1999), and the seven-volume series Satztechnik Typograﬁe by Richard Frick, Christine Graber, Renata Minoretti, Martin Sommer and Werner Meier (Zurich: gdz AG and Berne: Comedia Verlag, 1998–2005). Obviously, typography teachers in Germany and Switzerland must explain letterform terminology to their students. I have some sheets from the American-born Kate Wolff, who teaches at the Schule für Gestaltung in Basel, that use both calligraphy and typefaces (a welcome smorgasbord of Stempel Garamond, Bauer Bodoni, Helvetica and Futura) to illustrate deﬁnitions. Best of all, she includes some italic and fraktur letter parts. She provides terms in both English and German (e.g. elefantenrüssel /elephant trunk to explain the initial swash in fraktur capitals). Note: All of the websites that I came across in my surﬁng for examples of letterform terminology were either American or English. Using Italian search terms turned up primarily unillustrated glossaries. Those sites with images (e.g. liceocaravaggio.com) took them from American books and substituted Italian for the original English text (e.g. ochiello for eye of e.) We need to broaden our discussion of letterform terminology to cover languages other than English. Many of the new terms found online have seeped into the vocabulary of my History of Type students at the School of Visual Arts, forcing me to reassess those—gathered from calligraphy and lettering books as well as typography books—I have used for thirty years. I have begun to create an enlarged list of terms that includes not only ones I ﬁnd helpful (e.g. overshoot) or reasonable alternatives to my existing one (e.g. link versus neck), but also ones I disagree with (e.g. tail for part of R) or consider pedantic (e.g. tittle, which I detest). After all, the whole point of terminology is to aid communication and thus I believe it is worth knowing the terms that others use, even if they are not the ones that I do. This is an additional reason for including deﬁnitions in many languages. A century ago the number of people who needed to know letterform terminology was small. People worked in print shops or design studios where they only needed to know the terms that allowed them to conduct business with each other or with customers. The shift to teaching typography in design schools did not change the situation much at ﬁrst because the world of type was still grounded in metal type and letterpress printing. Teachers could easily point to what they were trying to describe to students. This way of thinking somehow held on for a few decades after the demise of letterpress printing. The rise of phototype and then digital type made it more imperative that students have visual aids to understanding the parts of letters, but such aids, as we have seen, remained fairly simple. I started this post with the intent of explaining why all existing attempts at letterform terminology—including the best ones from Gaskell, Benguiat and Young—fall short. There has been a bias toward seriffed roman type which is understandable given that it was and still is the dominant category in use. The common decision to use a single typeface—whether Bembo, Goudy Oldstyle, Times Roman, Clarendon or Scala—to illustrate the parts of letters has lead inevitably to omissions since some terms (e.g. ball terminals) are only found in a particular group of typefaces. More importantly, there is little information about blackletter, italic, scripts, display types and decorative types. Without an accepted terminology for these other categories of type we will be unable to discuss their features clearly and intelligently. For the past four years Abby Goldstein and I have been at work on a book about script typefaces. In the course of researching and writing it we have had to develop a terminology to describe the parts and aspects of script letters. I will show our working illustrations in a follow-up post to this one. * Baudin also wrote, “The classiﬁcation of typefaces is full of pitfalls. Especially for beginners who want to classify all typefaces in sight before they can even correctly identify one of them. No classiﬁcation will ever satisfy all parties.” (p. 99). His last sentence is equally applicable to the topic of letterform terminology.